Arguably the most important piece of kit for any climber is the rope they tie into. In recent years there have been significant developments in rope design leading to lighter, safer and, for their weight, more durable ropes. One of the market leaders in this field is Beal, with an impressive array of top-end ropes in their range, including half (double) ropes from the more specialist 7.3mm Gully to durable workhorse 8.6mm Cobra. Finding a niche somewhere in between is the Beal Ice Line 8.1mm half (double) rope which we’ve on test for the past year. The first thing to stand out about the Beal Ice Lines, in comparison to other ropes in this class, is just how thin they are. Compared to our reviewer’s regular Mammut Meteor 8.3mm, despite a mere 0.2mm stated different in diameter, the Ice Lines we visibly thinner and packed down significantly smaller – so much so that it became possible to use a smaller pack with the rope inside. The reduced bulk of the Ice Lines also translates to less weight, around 39g per metre / 2340g per 60m rope, making the Ice Lines the lightest half rope in the 8mm > range and even beating some of the competitors’ ultra-thin 7.7 – 8mm half ropes (e.g. Petzl Paso 7.7mm; Sterling Fusion Photon 7.8mm; Edelrid Apus 7.9mm; and Mammut Phoenix 8mm), all of which weigh around 42g per metre / 2520g per 60m rope (manufacturer’s stated weight). Lighter ropes are available in the < 8mm range, such as the Mammut Twilight 7.5mm and Beal Gully 7.3mm – gulp! In terms of durability, the Ice Lines have so far withstood the best part of 2 seasons of winter climbing in Scotland, a summer of mountain trad climbing and a week of summer alpine climbing around Chamonix. After many abseils over sharp granite, some crampon abuse and the hours of exposure to the wind, rain and snow the Ice Lines remain perfectly serviceable, albeit, in the last few months some relatively minor but noticeable fraying on sections of the sheath has occurred. This is offset somewhat by the “UNICORE” technology – the process of bonding the core to the sheath – which Beal have used to improve safety margins and alleviate the risk of the sheath being swerved and slipping. On balance, we consider the Ice Lines to be sufficiently durable for their intended purpose (i.e. big summer/winter mountain days and long multi-pitch climbing) but if you’re looking for a do-it-all workhorse, look at something like the Beal Cobra 8.6mm or Mammut Genesis 8.5mm (which many consider to be standard in 8.5mm half ropes). In addition, the “Golden Dry” treatment (applied to the sheath and core) has been very effective at deflecting moisture and dirt, with no notable issues such as frozen ropes on cold, wet and windy days. In terms of handling, Beal ropes are renowned for their smooth slick handling and the Ice Lines are a prime example of this. On test, we noticed they would glide down snow slopes and run off ledges with no encouragement required making abseils notably slicker. This also plays a part in reducing friction and resultant drag on long pitches. Although this is a double-edged sword as their slickness demands attention from the user to avoid stacked ropes inadvertently escaping off belay ledges. They also require more care when abseiling if you’re used to thicker ropes. A problem often associated with such thin ropes is tangling. We were expecting this to be an issue in light of how thin and slick the Ice Lines are. 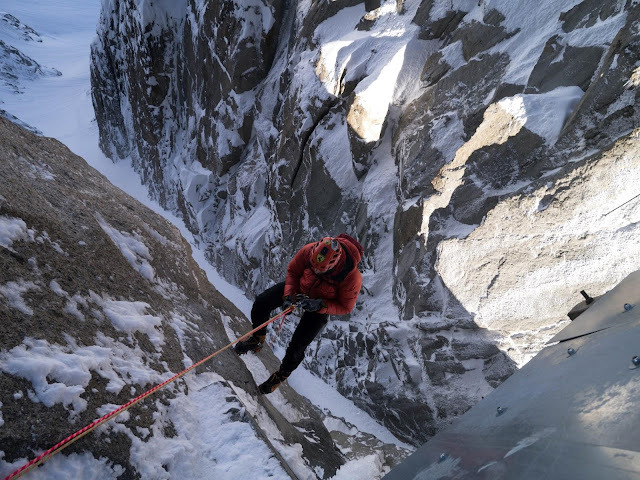 However, our reviewer commented that this never really developed as an issue with the Ice Lines so long as a basic level of rope management was used. 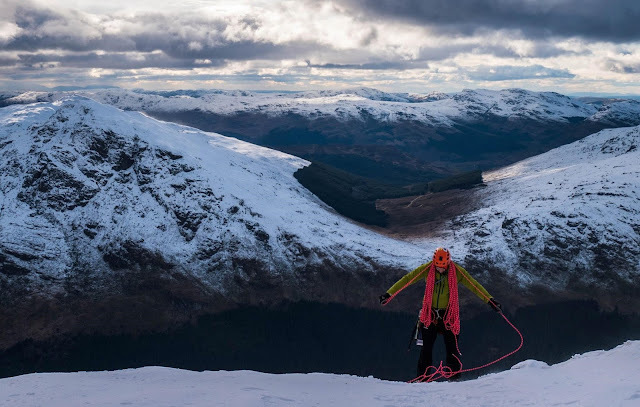 On one occasion some kinks did develop following a hasty retreat during a typical Scottish “hoolie” although we suspect poor rope management was more the issue. Finally, one minor niggle to mention for any prospective purchasers, the Ice Lines do not come with a middle marker. Beal sells a special pen for this purpose which may explain the omission. We felt this was a bit cheeky considering the price tag. Marks off Beal! Things we like: class leading handling and weight; minimal bulk; distinctive colours. Things we don't like: long-term durability; no middle marker.